Brandon Marshall’s backstory has become well known to NFL fans. Even legions of people who don’t care about football are now familiar with the Pro Bowl wide receiver of the Chicago Bears. But if you’re not, NFL Films’ Brandon Marshall: A Football Life, the newest edition of the Emmy-nominated series, will reacquaint you with his clinical diagnosis of and battle with Borderline Personality Disorder, past issues with domestic violence, struggle to cope with the murder of teammate Darrent Williams, escape from a violent Pittsburgh neighborhood and roller coaster career. Yet it’s not uncommon for estimable leading men to occasionally get shown up when a similarly talented supporting actor hits it out of the park. Call him Heath Ledger, Christoph Waltz, Robin Williams or even Cuba Gooding (a.k.a Rod Tidwell), but Bears quarterback Jay Cutler, a teammate of Marshall’s for six of their nine NFL seasons, is often a scene stealer in his buddy’s biopic. 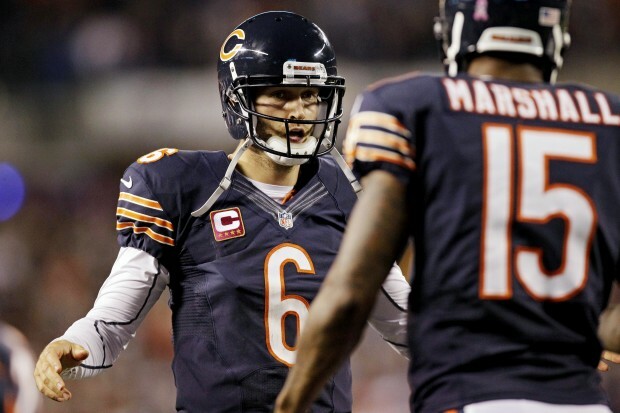 The real jewels come from NFL Films clips collected over the years of Cutler playfully (and sometimes not) mocking the ebullient and spotlight-craving Marshall — wait until you see him quash the wideout’s vertical leap — in practice and on the sideline. Bears tight end Martellus Bennett calls the duo, drafted together by the Denver Broncos in 2006, the “Tom and Jerry” of the NFL. Previous PostReggie Bush defends Adrian PetersonNext PostControversy from Ray Lewis? No way!